My dad tells me that when he was a kid, it was extremely important that you not miss the holiday TV specials - they aired once, and if you missed it, you were out of luck for the next year. Having grown up with access to classics like Rudolph the Red-Nosed Reindeer and Frosty the Snowman on VHS, I never had to suffer this tragedy. And now, my dad owns a boxed collection of holiday favorites to ensure that his grandkids will have the opportunity to watch these movies every year. When I learned that The Coterie Theatre would be presenting Rudolph the Red-Nosed Reindeer: The Musical as their holiday production this year, I was excited. It had been a few years since I had seen the original tv special, but I knew that its evergreen popularity was sure to inspire a hilarious and endearing family event. We were able to attend the opening night production last week, and I'm happy to say my intuition was not in error! 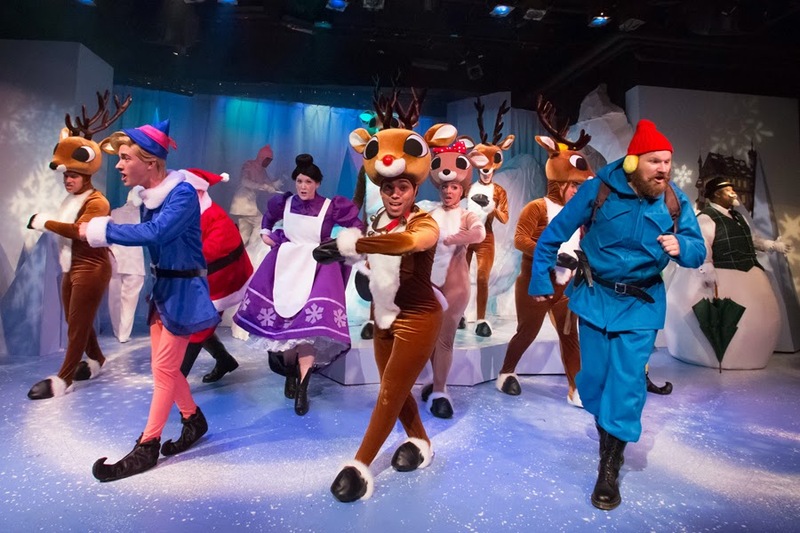 Reindeer: The Musical, running November 4, 2014 – January 4, 2015. Lincoln's first visit to The Coterie was to see Chitty Chitty Bang Bang the Musical earlier this summer. He did great with that show, so I figured an upbeat holiday tale would hold his interest. Addie is usually pretty content to sit with me versus wandering off to explore, so we decided to be super adventurous and took both kids with us to the 7:00pm performance. Okay, in hindsight, a show at bedtime was maybe not the best idea - but aside from some impatience before the production began and one relocation mid-show, both kids did great and thoroughly enjoyed themselves and the characters portrayed for them onstage. The Coterie Theatre. Rudolph the Red-Nosed Reindeer ® The Rudolph Co., L.P. The production celebrates 50 years of Rudolph (the TV special debuted in 1964) and touches on all of the familiar story points, with adorable puppets that are a throwback to the stop-motion animated forest friends in the television show. 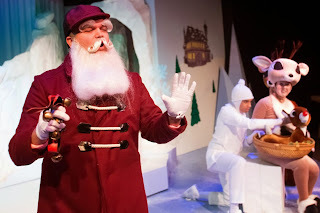 When it doesn't make sense to have an actor moving something on stage or transporting a puppet, cast members are cleverly disguised as "snow" by wearing all-white costumes that help them blend into the icy set design. In case you are unfamiliar with the story, it follows a young reindeer (Rudolph) who is ashamed of his shiny red nose and finds himself an outcast in Christmas-town because of its glow. 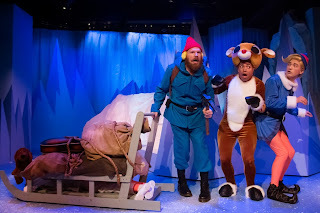 He heads off on his own, meets up with new friends Hermey (an elf who wants to be a dentist) and Yukon (a prospector seeking silver and gold) and they travel to the Island of Misfit Toys together while escaping the Abominable Snow Monster of the North. Eventually, Rudolph figures out that he should stop worrying about fitting in and heads home just in time to save the day (and Christmas) during a snowstorm of epic proportions. 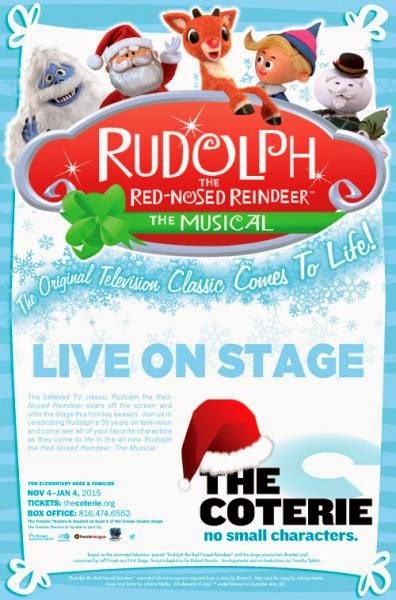 Red-Nosed Reindeer: The Musical, running November 4, 2014 – January 4, 2015. The show features an impressive array of local talent. 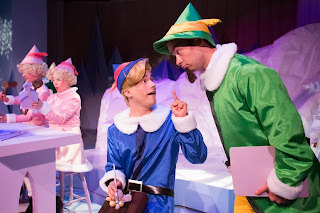 The leading characters of Rudolph (Tony Pulford) and Hermey the Elf (Christopher Carlson) were spot-on in their roles and made it very easy for us to be drawn into the world of Christmas-town. Standout smaller roles included the Boss Elf (Jake Walker - hilarious interpretation of the role), Yukon Cornelius (Logan Black) and Sam the Snowman (Ron Lackey). running November 4, 2014 – January 4, 2015. If you're in Kansas City, you don't want to miss this heartwarming holiday production! Rudolph the Red-Nosed Reindeer plays now through January 4 at the Coterie. Tickets are available online.